REVIEWING:REAL VAMPIRES, NIGHT STALKERS, AND CREATURES FROM THE DARKSIDE - PLEASE INVESTI GATE VAMPIRES RESPONSIBLY! In devouring my copy of "REAL VAMPIRES, NIGHT STALKERS, AND CREATURES FROM THE DARKSIDE by Brad Steiger," I realized that "This book has real bite!" It mesmerizes you from the instant you see the cover art. This is the of course definitive book on real Vampires that we the living have been waiting centuries to read. I actually believed through my personal Vampiric research and that by reading many vampire tales, books and articles over the years that I personally knew all the facts and the fictions there were. But Steiger's work has opened my eyes to a world of the undead that I never really knew or believed existed. We, in the paranormal investigation field, assume that we actually know and understand everything about the undead creatures that prowl the shadows. When in truth we know we do not. I personally love the way that Mr. Steiger entwines informative personal views, accounts and reference material for this volume. The Creatures that haunt these pages are more flesh and blood then would or could be imagined. His depth as a writer, historian, researcher and cataloger expresses the understanding that only he can make us aware of. Vlad the Impaler, Elisabeth the Countess of Blood, Jack the Ripper, the Zodiac Killer, Jeffrey Dahmer and actual interviews with modern vampires themselves. Those the real blood sucking sub culture of today. And least we forget the El Chupacabras and those midnight cursed humans, aliens and beast that roam the fringe of civilizations still. This Book does cover it all. Some might relate to you that the book does come across as a text book as well as case book rolled into one. I am sure any student of the Paranormal or Vampire lore will not want to let this great work pass them by. The Key Points on Vampires is they always come back to haunt the living. But the how's and the why's have always eluded us until now. My personal favorite tale is that of "The Blacked-Eyed Beings" This did set me on a new quest of investigation. It also sent a chill through my soul for I know now the deep truth behind the myth. As for the artwork, this book is beyond compare. I would almost state that it could be a table book, from the artwork of the great Ricardo Pustanio. His works are so "alive". If I could only take the artwork from the book, and "blow" them up and put them on my walls as posters, I would feel like I was in my own little heaven. Great job, Mr. Pustanio!!! Everyone, go and buy this book, read it, memorize it, hand it down to your children!!! This is a must read and must own best selling book for every library, a proud item to own. Thank You Again Mr. Steiger!!!!!!!!!!!!!!! 1 Skull - The facts just the facts. A complete wipe-out, books in which I can see no redeeming value whatsoever. 2 Skulls - The title Catches your attention but the read never keeps it - Let the Reader beware! 3 Skulls- Well Worth Reading- Check it out "You Won't be disappointed !" Books that are perfectly fine, if their subject matter interests you. 4 Skulls - Almost perfect. Excellent books that don't quite make my classic list, but are still well worth reading. 5 Skulls - A must read. A perfect book to top off any collection. Simply the Best there is! And a real must buy! Sure to be "The definite classic"! ON SEPTEMBER 1, 2009, AN ANTIDOTE WAS RELEASED THAT WILL COMBAT THE HORDES OF SEDUCTIVE CREATURES OF THE UNDEAD WHO HAUNT MOTION PICTURE AND TELEVISION SCREENS PROMISING ETERNAL YOUTH AND UNDYING LOVE WITH THE FIRST BITE. Real Vampires are not the undead, returning from crypt or cemetery plot to steal blood, the vital fluid of existence from the living. Although they may look like us—and when it serves their purpose they may skillfully impersonate us in order to deceive and to prey upon us—they have never been human. Real vampires are parasitic, shapeshifting entities that feed upon the energy, the life force, and the souls of humans. From whatever dimension of time and space they may have originated, real vampires may be compared to an ancient, insidious virus that first infects, then controls its host body, causing it, in turn, to possess other victims, to form secret societies, blood cults, and hideous rituals of human sacrifice. Regardless of the seductive aura of the vampire depicted in contemporary novels, films, and television series, none of these romantic transformations of an ancient menace to humankind portray real vampires. While the vampiric virus may infest handsome men and beautiful women, none of those infected have superhuman powers. Real vampires and those whom they possess are loathsome slashers, rippers, and murderers who do not promise immortality with their sensual “bite,” only a painful death. Real vampires and their human hosts can walk freely in the light of day. The rays of the rising sun do not send them scurrying back to their coffins. Crucifixes do not cause real vampires to shrink back in fear. Real vampires are the spawn of ancient entities such as Lilith, the seductive fallen angel, or of other paraphysical beings—such as the Jinn, the Cacodaemons, the Raskshasas, and the Nephilim—who have traversed the boundaries of time and space to prey upon humankind. While this book focuses on the supernatural, the multidimensional, and the paraphysical beings who have interacted with our species since prehistoric times, we also visit the contemporary vampire community living among us today. Leading members of the vampire community share with us the basic findings and the extensive demographics of the Vampire and Energy Workers Research Survey for 2009. These "vampires" are not murderers, sociopaths, or supernatural beings. They are a subgroup within our society who are perhaps unique, but who are not after our blood. Real vampires are immortal, and when the spirit parasite that has invaded a human body has tired of that fleshly residence, it dispassionately discards its temporary dwelling and possesses another, abandoning its former host to death and decay, rather than to an existence of attractive eternal youth and everlasting sexual prowess. AND NUMBER 1 HERE AT OUR HAUNTED AMERICA TOURS BESTSELLER'S LIST! Brad Steiger is an award-winning writer with more than five decades of experience exploring unusual, hidden, secret, and strange occurrences. He lives in Forest City, Iowa. Steiger has authored or coauthored 150 books on the mysterious and unknown, including the classics Ghosts, Ghouls and Other Peculiar People, The Werewolf Book: The Encyclopedia of Shapeshifting Beings, and Mysteries of Time and Space. 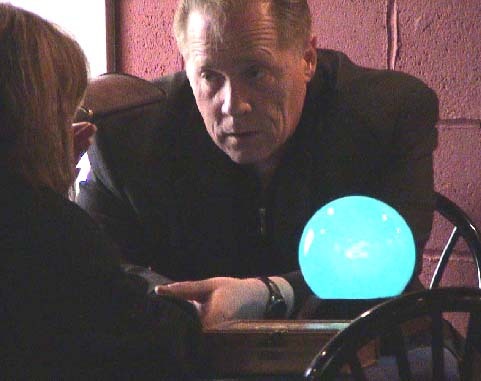 He and his wife, Sherry, coauthor the "Miracle" series, and Steiger appears frequently on radio and television and guests twice monthly on the nationally syndicated Jeff Rense Show to answer listeners' questions about ghosts in their own homes.